'Joolsesham in the Gheer. Kattywar. Hot Springs, 6th April 1869'. bl.uk > Online Gallery Home	> Online exhibitions	> Asia, Pacific and Africa Collections	> 'Joolsesham in the Gheer. Kattywar. Hot Springs, 6th April 1869'. Water-colour painting of a temple with hot springs in Kathiawar by John Frederick Lester (1825-1915), 6th April 1869. 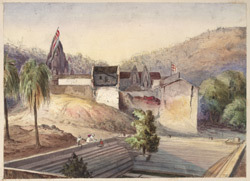 This image is from an album of 30 watercolours made between 1865 and 1877 in Kathiawar, Bombay, Poona, Mahabaleshwar and Savantvadi State. The album cover is lettered in gold with the word: 'Sketches' and inscribed inside cover: 'J.F. Lester'. Kathiawar is a peninsula in Gujarat state, west-central India. It is bounded to the north by the great wetland of Rann of Kutch, to the west by the Gulf of Kutch and to the south by the Arabian Sea. The area has a rich heritage of Hindu and Jain buildings and from the 15th century European Colonial nations established factories and trading bases around the coast. Kathiawar was never absorbed into the British Empire but was fragmented into over 200 petty states ruled by princelings. Upon Independence in 1947 the princely states of Kathiawar were grouped together to form Saurashtra. This area boasts many ancient temples and has a number of hot springs, the water of which are held to have medicinal value.